Your host of this evening will be Peter Macintosh. 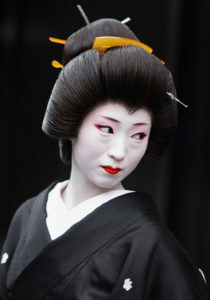 Peter has lived in Kyoto almost 20 years, and is considered to be the foremost Western expert on geisha. He was married to an ex-geisha, studies Japanese arts and is a lecturer on Geisha Studies at Kansai University. The evening will begin with a Walking Lecture through some of Kyoto’s geisha districts. 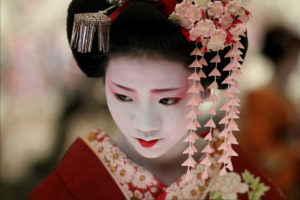 Peter will explain about the geisha’s world – past, present and future.If you are lucky you will have the chance to see a geisha or maiko (apprentice geisha) as they head to the first appointment of the evening. After the walk, you will enjoy a sumptuous Japanese dinner in the private room of a traditional restaurant with free flow drinks. Enjoy dinner and drinks with an hour of private maiko or geisha entertainment consisting of conversation and dancing accompanied by the shamisen (Japanese stringed instrument). You will also have a chance to ask questions about the geisha and their world (translated into English by Peter), as well as play traditional drinking games. 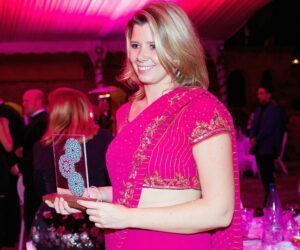 This is a special night of food, drink, traditional entertainment, and great photo opportunities. Dinner and free flow drinks are included. 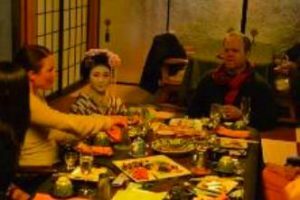 Explore the back streets of Kyoto`s geisha districts with the leading foreign geisha culture expert, Peter MacIntosh who has spent half his life living in Kyoto. He was married to an ex-geisha, studies Japanese arts and is a lecturer on Geisha Studies at Kansai University. On a private walk through the geisha districts he will discuss the history as well as the present situation of the flower and willow world of Kyoto before stopping at a private, members only ochaya (geisha teahouse) where you will have matcha green tea and Japanese sweets in the company of a maiko or geiko. No other customers will be present. There will be traditional song, dance and games along with great photo opportunities. Please note this is just drinking tea and sweets with the maiko or geiko, not a tea ceremony, which is a traditional art geisha do not practice.